Born in 1947, James Leroy moved to Ottawa when he was 11, where he taught himself how to play the guitar and piano. He became interested in music while attending high school, and began leaning towards folk artists like Bob Dylan, Pete Seeger, and The Kingston Trio. He later attended university in the US but returned to Canada when all his friends were drafted. Aspiring to be a folk singer, he took vocal lessons from Bruce Cockburn, and soon spent time singing in the local coffee houses when he wasn't selling tires for his father's Canadian Tire store. He also peddled his songs to other local groups, and Canada Goose, September Dawn, and Renaissance all gave them a go, but never recorded any of them. He also tried singing in some of the smaller clubs around the Ottawa Valley. But it wasn't long before he pursued music full-time, and strayed from the folk world and after several attempts convinced manager Harvey Glatt (3's A Crowd, Canada Goose, The Esquires) to help out. He started a pop band with guitarist David Oslund, drummer Gibby Lacasse (later of Lydia Taylor and Stampeders), and Chuck Bergeron on bass (all who'd previously served time in Harry Young's group Jumbo) and ex-Canada Goose members singer Valerie Tuck and steel guitarist Gary Comeau (also formerly of The Esquires) were quickly added. Originally simply called The James Leroy Band, they came up with the name Denim from one of the first songs he'd written, " You Look Good in Denim," and soon signed a deal with GRT Records. They headed to Toronto's Manta Sound studio with Glatt producing, and released the syrupy ballad "Touch of Magic" as a single on Glatt's GRT Records. Encouraged by the reception from radio stations across the area, he sent the band back to Manta with producer Adam Mitchell (Paupers), and released their only album, simply titled DENIM in the summer of 1973. "Touch of Magic" reached #6 on the charts and "You Look Good in Denim" followed it into the top 20. Later that year "Make It All Worthwhile" entered the top 20 in several markets across the country. A cross-country tour took them into the US, as well, but looking for a new direction, Leroy dissolved the band later that year, and went solo shortly after. The lineup though was pretty much the same, except Marvin Dolgay replaced Oslund on guitars and Wayne Leslie (ex of Canada Goose, Townsmen) was the new bass player. They headed back to Manta Studios with Ian Thomas producing, and a pair of singles followed later that year - "Some Kind Of Fool" b/w "Fast Eddie" and "Lady Ellen" b/w "Lady Comes," but neither particularly set the world on fire. The better part of a year was spent on the road, often with The Stampeders, and in fact was originally intended to be on their recording of "Hit The Road Jack" doing a duet impersonation of Wolfman Jack with Ronnie King, though it was scrapped. During down time, Leroy also wrote some material while he'd retreated to a northern Ontario cottage. He also made appearances on Keith Hampshire's "The Music Machine" TV program. A solo album was never released, and getting out of show business for awhile to re-assess his career, Leroy took the job as entertainment manager at the Water Tower Inn in Sault Ste Marie. There, he met members of Major Hoople's Borading House in '76. He convinced them to shorten their name to simply Boarding House, and released "You Girl," a song they'd previously written before Leroy showed up, on Axe Records, did a few tours around Ontario and into the Maritimes. When that venture had run its course, from there he joined up with The Terry Crawford Band, a band from Winnipeg that was showing promise. Initially, They reworked some songs he'd written earlier and recorded them, though nothing was release. And again they toured central and western Canada, making a few stops Stateside. In 1978, GRT re-released "You Look Good In Denim," and backed it with "Touch of Magic," shortly after he'd reassembled a band that consisted of former Denim players LaCasse and Dolgay, as well as Paul Faubert on bass and John Stimson on keyboards. But sadly on May 10, 1979, Leroy committed suicide while at the Macy Hotel in Ottawa. He was 32. 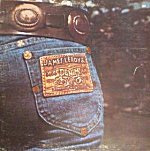 In 2008, Janus Records re-released Denim's only album on CD, adding four tracks from Leroy's solo career as bonus material.